Dental implants are artificial tooth roots. These roots form a permanent base for replacement teeth. These are a popular and are a long-term solution to people who do not want to deal with bridges, crowns or dentures. These are also ideal for those who have missing teeth, teeth that are falling out or who are suffering chronic dental problems. Dental implants fit, feel and perform just like natural teeth. 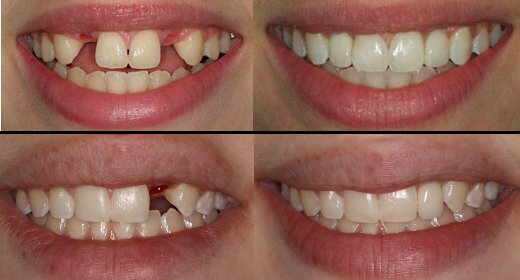 For this reason, they are quickly becoming the standard in tooth replacement. • Appearance - Dental implants look and feel like real teeth. They are designed to fuse with your bones, so they become permanent. • You can speak without worrying your teeth might slip or cause a whistling noise. This is a major benefit that dentures, especially poor fitting ones, do not have. • Comfort – Implants are formed to fit your mouth so they eliminate the discomfort that dentures cause. • Confident Eating - Sliding dentures can make it difficult to chew. Implants move and act just like your own teeth so you can eat without pain. • Self-esteem – Feel better about yourself when you get your smile back with the help of dental implants. Dental implants have the chance of developing periimplantitis. This is a condition where inflammation of the gum and bone surround the implant. It does not happen after every implantation, but it can happen after an infection or if you tend to grind your teeth. Periimplantitis can result in losing an implant if it is left untreated. After getting dental implants, follow the recommended maintenance care at home. Keep up with your follow-up visits at the dentist office. Care at home involves regular brushing and flossing to keep food debris and plaque from accumulating around the dental implant. We are here to help you!